The Lion (Panthera leo) evolved in Africa about 3.5 million years ago and quickly spread to Eurasia, where it remained abundant until historic times. At the start of the Pleistocene, Lions from Russia crossed Beringia and spread southward throughout North and South America. These New World Lions are referred to the subspecies Panthera leo atrox, or simply, the American Lion. The American Lion is so named because of its New World distribution. The name Panthera may be derived from the Greek pan-, meaning “all”, and ther, meaning “prey”, translating literally as "predator of all animals”. Its species name, leo, is simply the Latin word for the Lion. 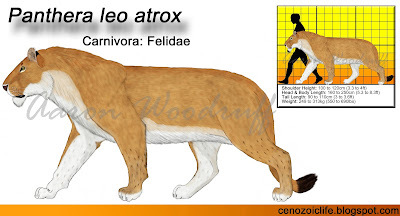 The name atrox is a Proto-Indo-European word meaning “atrocious”, “fierce”, “savage”, or “cruel”. Lions are typically found in more open habitats such as grassland, savanna, semidesert, scrubland, and open woodland, occasionally venturing into more forested areas where there are plenty of clearings in which large prey graze. Genetically, American Lions are identical to the Eurasian subspecies Panthera leo spelea, the Cave Lion. They descended from Lions that entered the New World from Russia via the Bering Land Bridge and eventually became isolated from the Old World population. Lions went on to colonize the whole North American continent from Florida to California east-to-west and Alaska to Honduras north-to-south. 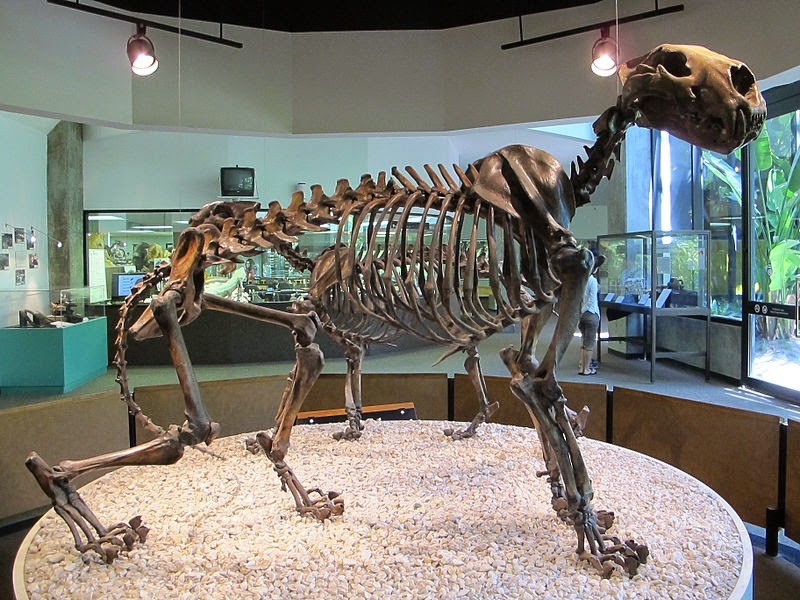 The Lions that once lived in the temperate and subpolar lands of the north grew 8 to 10% larger on average than most modern Lions from Africa and India. This larger average size is a great example of Bergmann's rule, which states that animals native to colder climates at the northernmost or southernmost reaches of their ranges will grow larger than their close relatives in the warmer regions nearer the equator. Larger animals lose body heat at a slower rate than smaller ones, and so this is a useful adaptive change. Among extant felids, the Siberian Tiger (Panthera tigris altaica) best exemplifies this principle. Until their relatively recent extirpation over the last few centuries, the largest wild modern Lions were to be found in the southernmost part of Africa, which experiences freezing temperatures during winter. Apart from this slight size difference, American Lions were anatomically identical to their living counterparts. However, because of their more northerly distribution these Lions would have needed a thicker and longer fur coat, particularly during winter. 32,000 year old cave paintings from Europe reveal that Pleistocene Lions had the same plain coats of their living relatives with some retaining a faint spotted pattern. Their fur is likely to have become paler in color during the winter months to better camouflage them against the snow. Also revealed through cave paintings, the male Lions of the Pleistocene lacked the exaggerated manes for which modern Lions are renowned for, having instead a smaller ruff of thick fur. The mane as we know it today is a recent evolutionary development among the species that originated sometime between 60,000 and 20,000 years ago. Lions are the largest land predators in Africa today. 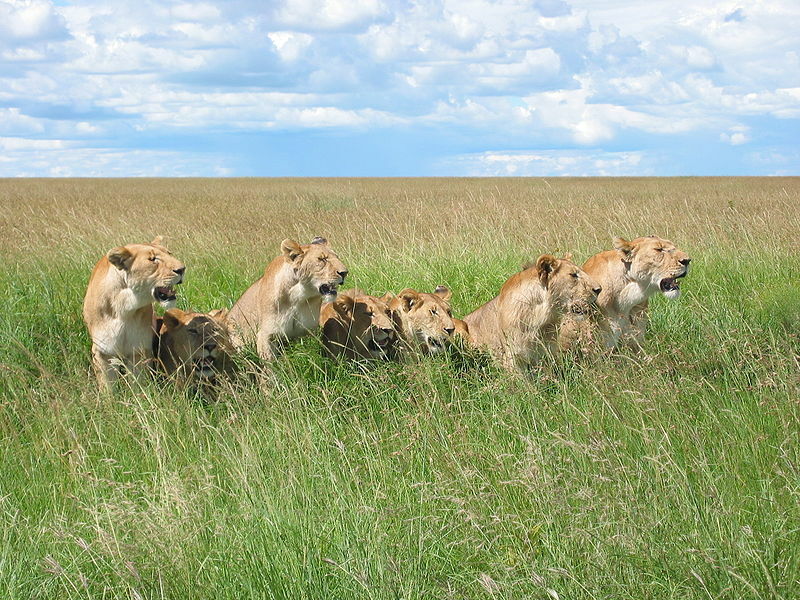 In areas with particularly high prey density, prides may comprise 10 to as many as 20 adults. During the Pleistocene, however, Lions shared their habitat with other large and equally formidable predators, greatly increasing competition pressure. This made securing and maintaining a kill more of a challenge and such a large group would have been a handicap when it came to procuring enough calories to sustain each individual group member. 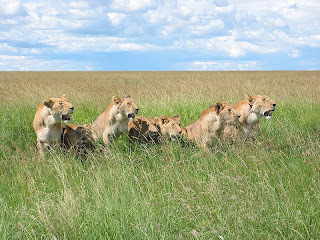 American Lions are more likely to have lived in the smaller social groups similar to what is observed among living Asiatic Lions; female groups consisting of 2 to 6 adults and male coalitions of 2 to 4. Smaller group sizes are more efficient because they enable the cats to bring down prey too large for a single cat to handle (500 to 1,000kg) while at the same time enabling each individual to obtain a reasonable share when a smaller kill is made (100 to 200kg). The most common prey animals taken by Lions fall between the 200 and 400kg range, which can be easily felled by one or two individuals with a meat yield sufficient enough to sustain all the group members for several days. Caribou (Rangifer tarandus), the Northern Hemisphere's equivalent to Africa's Blue Wildebeest, would have been among the most common prey, followed by various species of horses, llamas, and other large deer such as Wapiti (Cervus canadensis). In between these kills, the Lions would have opportunistically taken any smaller prey they could catch weighing 50 to 200kg. Such "snacks" would have included smaller deer like White-tailed (Odocoileus virginianus) and Mule Deer (O. hemionus), as well as the occasional pronghorn or peccary. When their regular prey was in short supply the Lions would have turned to larger animals within the 400 to 1,000kg range. Such prey would have included any of the various bison, musk ox, or larger camel species like Western Camel (Camelops hesternus) or Giant Camel (Titanotylopus nebraskensis). Hunting such big game required the collective strength of all the group’s adults. As with modern Lions, smaller prey animals would have been dispatched with a bite to the throat. 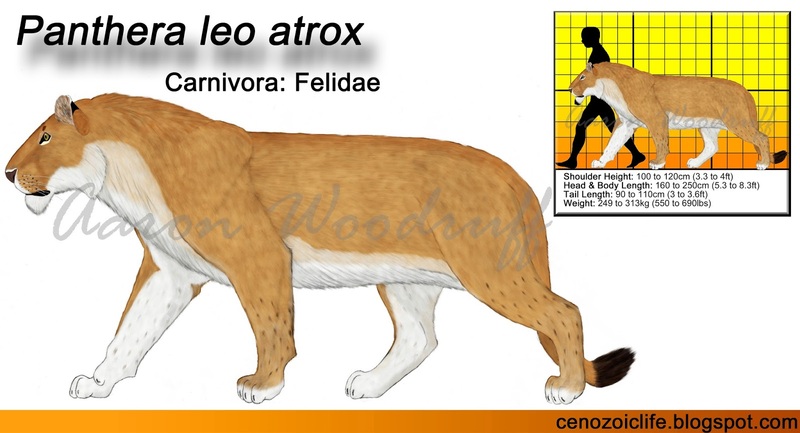 Larger prey species, whose necks were too wide for an accurate throat bite, would have been dispatched with a muzzle-clamp bite, during which the Lion bites down on the prey's face sealing the mouth and nose, causing death by suffocation. Direct evidence of this killing method comes from Blue Babe, a 36,000 year old Lion-killed Steppe Bison (Bison priscus) unearthed in the permafrost of Fairbanks, Alaska in 1979. The specimen, a large bull, bears distinctive Lion bitemarks on his nose! The modern African Lion is by far the largest land predator on the continent and it dominates all other carnivores with an iron fist. During the Pleistocene, however, this was not the case. Lions coexisted with many other great predators which individually could physically threaten it. Indeed if such predatory competition were present today, we would probably have to refer to the Lion as "the Prince of the Beasts". Interestingly, American Lions appear to have had slightly larger brains than their living relatives. This could mean that these Lions had more complex social behaviors and better problem-solving abilities, which would have helped it in its competitor-rich environment. The American Lions' most substantial competition would have come from the Gray Wolf (taking the slot that Spotted Hyenas fill in Africa) and the Short-faced Bear, predators which shared the same habitat preference and presumably the same crepuscular-nocturnal activities. The latter of the two killers grew up to 4 times heavier than a Lion and could have easily dominated them at kills, possibly shadowing the hunting cats and then appropriating their kills. Modern Brown Bears employ this strategy in areas where they coexist with Gray Wolves. Differences in habitat preference, prey selection, population density, and circadian rhythm helped other predators to minimize competition with Lions. The American Cheetah (Puma trumani) lived in much the same habitat, but it specialized in hunting smaller, more fleet-footed deer and pronghorns which Lions would have rarely tackled. They would have also preferred to hunt during the day while Lions were more selectively nocturnal. Jaguars (Panthera onca) and Cougars (Puma concolor) were solitary hunters that would have hunted in more wooded or bushy areas and would tend to avoid open areas in which the Lion was common and thus minimizing contact. 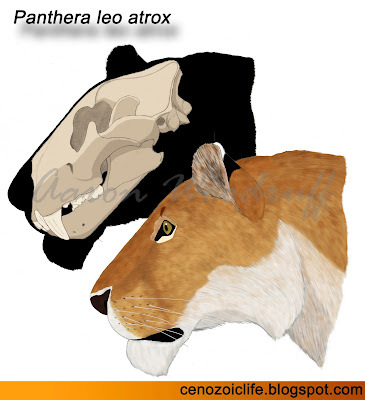 Dire Wolves (Canis dirus) and Saber-toothed Cats (Smilodon fatalis) lived and hunted in riparian or marshland habitats while Lions prefer drier areas. Hunting Hyenas (Chasmaporthetes lunensis) and Scimitar Cats had coexisted successfully with Lions for 3 million years in the Old World. Scimitar Cats (Homotherium serum) in particular would have hunted the same large deer and horses as the Lion, however, they would have more frequently selected the larger bison, camels, ground sloths, and juvenile elephants, which the Lions would have generally hunted opportunistically or when their regular prey was unavailable. Also, these predators had lower population densities than Lions and so would not have encountered each other often.